On January 1, 1892, a teenage girl stepped off a boat onto an island in New York Harbor and walked into the history books. Annie Moore, an immigrant from Ireland, was the first person to be processed through the new immigration station at Ellis Island. Today, you can walk in Moore’s footsteps at this one-time gateway to the United States. Ranger-led and audio tours invite you to imagine leaving your belongings in a pile of luggage and climbing the steep stairs to the cavernous Registration Room. 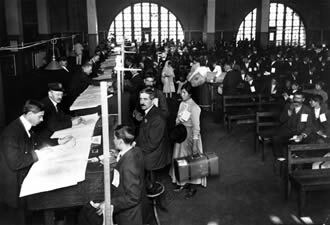 There, doctors carefully watched ascending immigrants for signs of any debilitating diseases. At the top of the stairs, doctors performed a quick physical exam, sorting out who was healthy and who needed closer inspection in the hospital. Those who passed the exam would then wait in line, sometimes for hours, to face a battery of questions to determine if they were likely to burden the United States. 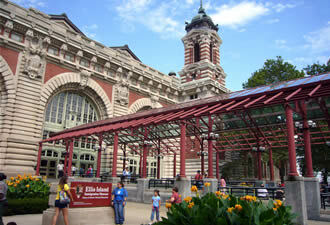 Ellis Island, at its busiest, processed thousands of immigrants each day. Their dozens of languages would echo through the Registration Room as they answered inspectors’ questions. Some immigrants were required to stay overnight, and today you can see their dormitories. You can also visit the Hearing Room, where decisions were made about who could enter the United States and who would be sent back, and participate in a mock hearing. 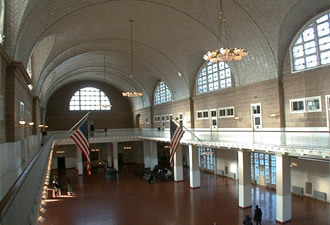 In addition to permanent exhibits illustrating the immigrant experience and the site’s complex history, Ellis Island has a schedule of visiting exhibitions. If you are interested in learning about members of your family who may have passed through Ellis Island, step into the American Family Immigration History Center and, for a small fee, peruse records from 1892 to 1924. Once you finish your visit to Ellis Island, you can continue to sightsee at some of New York City’s nine other national parks. Cultural and historic locations lie between Battery Park and Harlem, while natural experiences await you in the boroughs of Staten Island, Brooklyn, and Queens. Visit the website of the National Parks of New York Harbor to learn more. After Annie Moore cleared Ellis Island, she made her new home in Manhattan. To get a sense of the conditions in which she lived, visit the Lower East Side Tenement Museum, an affiliated site of the National Park Service. You can take a tour and see the apartment of a typical immigrant family. You can also learn about the changes New York City underwent as a result of its popularity with immigrants moving to the Land of Opportunity.